Department of cardiology was established in the year 1962. Since then it has been actively engaged in patients care, teaching and research. 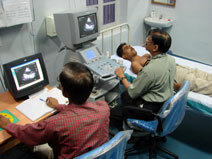 In 1998 division of Cardiology was upgraded as the full fledged independent Department . We are providing MBBS, MD (Medicine) training also apart from DM Cardiology superspeciality course. The Superspeciality course - DM (Cardiology) was started in 1979 and till date 30 candidates have been awarded superspeciality degree-DM (Cardiology).